Coronado 23rd Annual Jim Laslavic Charity Golf Tournament Co-Chair Bob Plumb, committee member Ken Kaminski, and Co-Chairs Jim Laslavic and Jim Palecek. The Rotary Club of Coronado proudly presents the 23rd Annual Jim Laslavic Charity Golf Tournament on Friday, March 15, 2019 at the Coronado Municipal Golf Course. The event provides a day of fun and challenging golf as well as an opportunity to sponsor military golfers and support worthy causes. 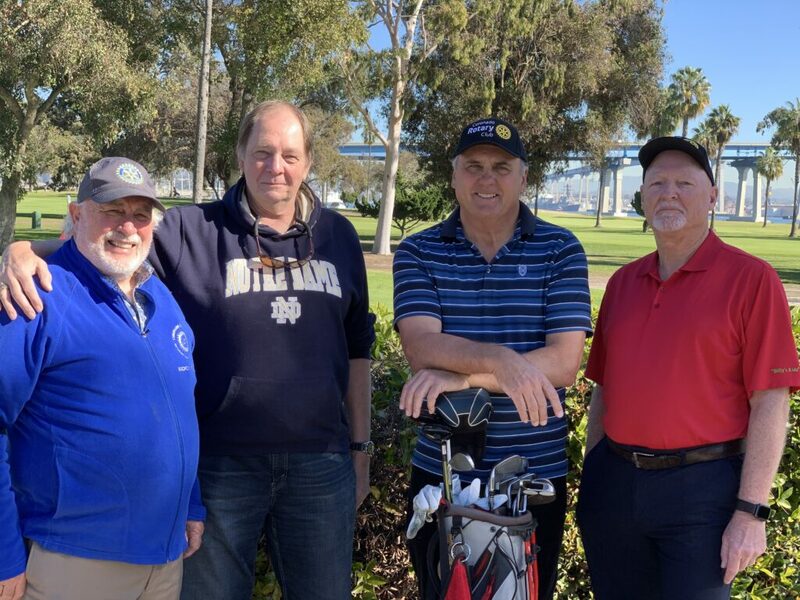 “Coronado Rotary’s annual charity golf tournament is one of our major fundraisers providing assistance to numerous community and international programs,” Coronado Rotary Club President Ivan Dunn said. Thousand Smiles: Provides surgery for children with cleft palates and disfigurements. PolioPlus: Rotary International has set a goal to eradicate polio from our planet by the end of this decade. Coronado Schools Foundation; Coronado Youth programs; Everyone A Reader. Big Brothers/Sisters: “Operation Bigs” provides mentoring to military children. San Pasqual Academy: Residential High School for foster kids. SAFE: Student and Family enrichment services. Feed the Needy: Serving meals to over 300 homeless people. Scouting: Support for Eagle and Gold Scout Projects, Scholarships and Supplies. Wounded Warrior Tennis Camp: Workshops for Warriors, Warrior Foundation. We support our troops! For more information on the event and to register, please visit www.coronadorotary.org and click the link for Golf Tournament or contact Jim Palecek at 619-519-2552.